People visiting another province want to enjoy everything it has to offer. Tourism highway signs help them do just that. 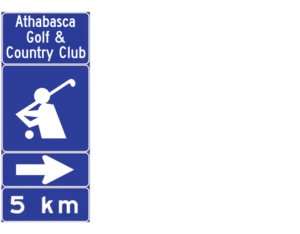 Single- and multi-panel signs help passing drivers find businesses, provincial facilities, visitor information centres, and other attractions in communities like yours. Alberta has already replaced their brown signs with blue ones. Other provinces may do the same in the next few years. 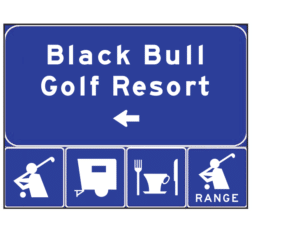 The new information is simple to understand and uses standard symbols for common attractions like campgrounds and museums. This makes it easier than ever for people to get where they’re going. We’re the only government-approved provider of tourism signage in western Canada. The Tourism Highway Signage program is an opportunity for your community to have signs near major highways and encourage people to visit. We’ll take you all the way from your application to manufacturing, installation, and maintenance. Your highway signage isn’t just a product: it’s full service for five years. If your community is rural or has under 25,000 people, these tourist attractions could be eligible for highway signage. Multi-panel signs are designed with three, six, or nine panels that display a business’s logo. These signs identify services that drivers should know about. If a local business meets the requirements below, it could be featured on a multi-panel sign. If your province has more than one sign program running at once, people can easily become confused. It’s hard for them to know what a sign means or if an attraction is worth visiting. With consistent signage, the highway not only looks better, but also is better equipped to take drivers where they need to go. Signs get damaged all the time. If a business has to replace their sign three times over five years, the cost is the same as a highway sign. We’ll cover all necessary repairs for five years. Once your community has filled its board, the costs balance out and you aren’t paying for it anymore. The result is a cost-free, worry-free sign that we’ll wash and replace as needed to keep your investment on the road. Many businesses use a local field or town land to put up a big sign with their name, phone number, and locations. It can be difficult to convince them to buy a logo panel when they’ll lose all that extra information. However, when a business’s logo is up on a tourism sign next to major brands, it places them on the same level as larger businesses. Passing drivers are more likely to visit because it looks like they’re endorsed by the province. We can bring in more tourists for your community and customers for its businesses. Some business owners have reported 15 percent more customers after their sign went up. If you need help convincing businesses to buy panels, we can supply sales materials to tell them about the program and what it can do.